1 Table spoon lemon juice per glass. Put 1 cup crushed ice in a mixer.Pour the Vodka, the orange juice and the lemon juice in mixer and shake well. Pour in a cold glass. A block of sugar per glass. A twisted piece of lemon peel. Soak the sugar cube in Angostura bitter and place it carefully into a long cold glass of champagne. Add a spoonful of crushed ice and the vodka in and gently filled with champagne. Garnish with lemon peel spiral. Put 4 Ice cubes in a mixing glass. Add Vodka and Vermoët in and stir well. Pour the mix in a cocktail or balloon glass, add a little bit of lemon peel juice and decorate with the lemon peel turned arround a stick (If you like to do so). 2 Parts USA barley whiskey. 1 Part lemon or lime juice. 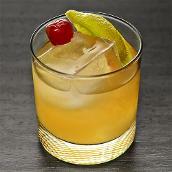 Put 6 ice cubes in mixing container, add whiskey and lemon- or lime juice and sugar in container. Shake very well and pour in glass. Decorate with a slice of orange and a cherry on a toothpick. 1 Part of the Cocoa Creme. Place four ice cubes in a bar mixer and add the remaining ingredients. Shake well and strain into a cold cocktail. In a heavy mug pour in a good shot of Jack Daniel's® Whiskey. Gooi ‘n goeie skoot Jack Daniel’s® Whiskey in ‘n swaar beker. Add a spoonful of honey, a cinnamon stick and lemon juice. Voeg ‘n lepel heuning, stokkie kaneel en suurlemoen sap by. Top with boiling water, stir. Maak vol met kookwater en roer.